My new book is officially out! And can be purchased online and of course, anywhere books are sold (and if your store doesn’t have it, ask them to carry it!). If you can’t tell, I’m extremely excited that this baby is finally in the world. It is the GUIDE (yes, guide!) that I always wanted to have. One which explores solutions to the challenges one may meet in a low-sodium life. 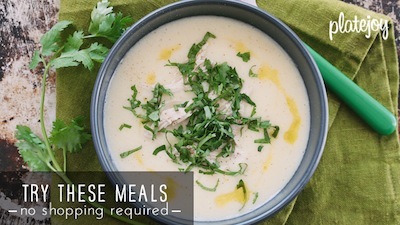 From your tastebuds to your office kitchen (remember that microwave noodle soup?). And while I wrote it for you, I also wrote it for your friend with a nut allergy. And that coworker starting a vegan diet. And your uncle who eats a lot of prepared foods. Or your college graduate who is about to own a refrigerator and stove of his or her own. Or that person you met on the bus who didn’t know what a turnip is. Or your coworkers who could use an office pantry makeover. Or that gal from your community garden who needs more ideas on how to use up all that summer squash (and may I suggest page 243). In sum: this book is for everyone. Because in its most simple form, lowering sodium just means eating fresh foods. Being creative in the kitchen. And not being afraid to twist recipes and try something new. So get your copy (or COPIES!) today. 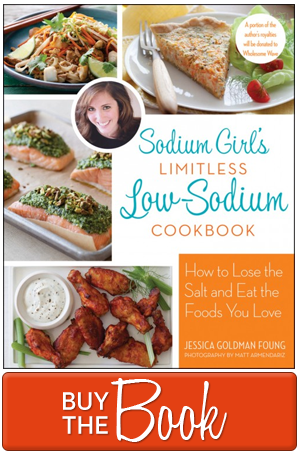 And even if you may already be a low-sodium or cooking expert, I assure you that you will find plenty of new tips, ideas, and YES, recipes in this book that will add flavor to your food and life. The Good Bean Fruit & No-Nut Bars: They almost taste like peanut butter (but there’s none of that stuff in there!) They have a good crunch to them, slightly sweet, and a perfect snack when on the run. Rice Crackers (No-Salt-Added or Lightly Salted): This is my number one snack! I slather it with avocado or Greek yogurt. A little chili pepper and some no-salt-added turkey meat or chicken or shredded zucchini for a super easy meal at home, at work, on an airplane, or wherever life takes me. Cauliflower Bread: I make a stack of these vegetable-based “breads” before I head out on any trip. Because they include eggs they are perishable. But if you time your car ride/flight right or pack with some ice, then you’re safe. And you’ll have the perfect veggie-filled snack to munch on during travels. Popcorn: No-salt-added popcorn is an easy, flat snack to pack that will give you something simple to eat. But don’t forget to get creative. Add no-salt nuts and dried fruit (okay, and chocolate) for a DIY, hotel room trail mix. Or even, cover it will a little olive oil and spice and use like croutons on top of salad or even a plain piece of cooked fish. Avocado: These fruits travel ridiculously well. And with one in your bag at all times, you’re guaranteed a good, fatty treat. Whether you it (out of desperation) with a spoon. Slather it on those race crackers or cauliflower bread. Or add to a morning scramble or afternoon salad or use as a binder in my MacGyver Vinaigrette (WHICH IS IN THE NEW BOOK!!!). Tea (and Coffee) Packets: Poor tea and coffee. They’re often just stuck in cups. But did you know you can use them like a spice!? It’s true. Try rubbing coffee on your meat before it hits the grill. Or using tea to flavor microwave soup. Or using these sweet matcha packets to wake up simple oatmeal and yogurt! Other Ideas: Oatmeal. Microwave rice! Hard boiled eggs. Raw and shredded veggies. Lemon or lime (for instant flavor!). Canned beans. Travel spices. Corn tortillas. Nori sheets. 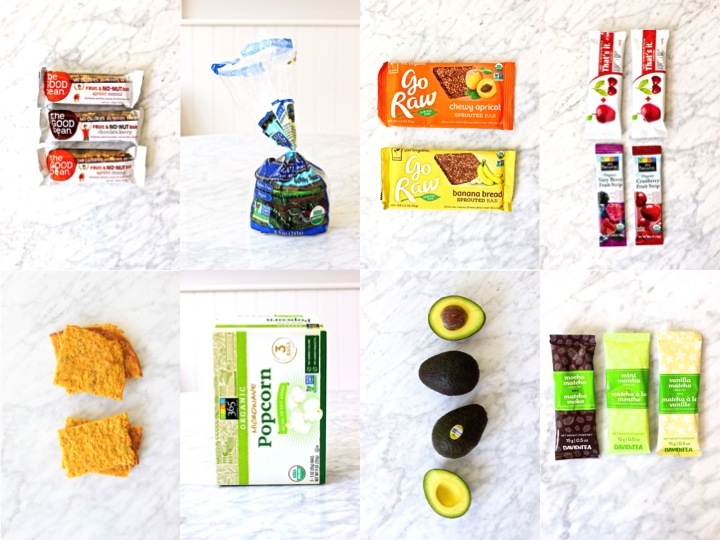 There are so many other ways to pack your bags so that you never go hungry. Or without flavor. So be sure to comment below or on Sodium Girl’s Facebook page with your other ideas! 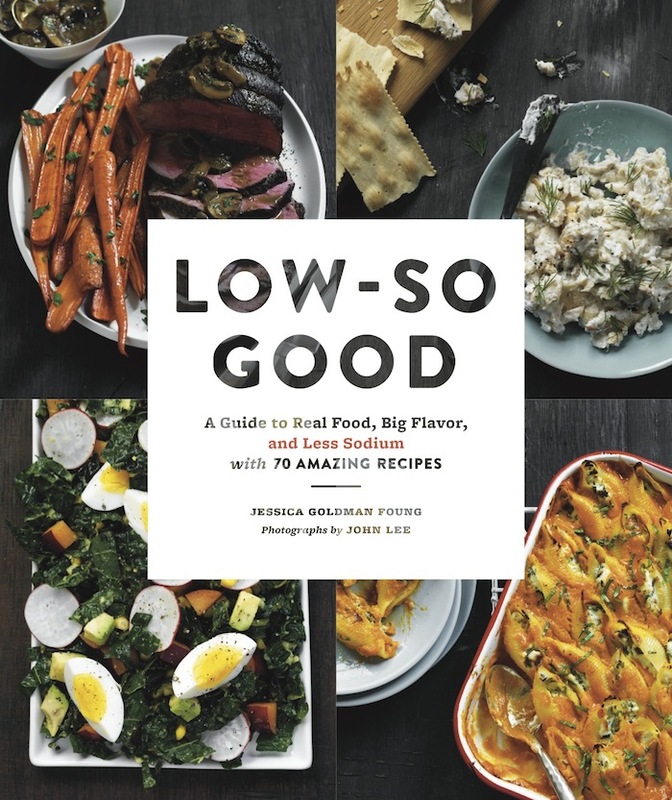 And be sure to buy the new book and tag your pictures on Instagram with “#lowsogood” so I can repost them! And if you buy the book, be sure to add a review to Amazon as well! Would love to hear your thoughts. With that, I’m off to celebrate with something bubbly (which was in my bag, too). And grab a glass for yourself, too.